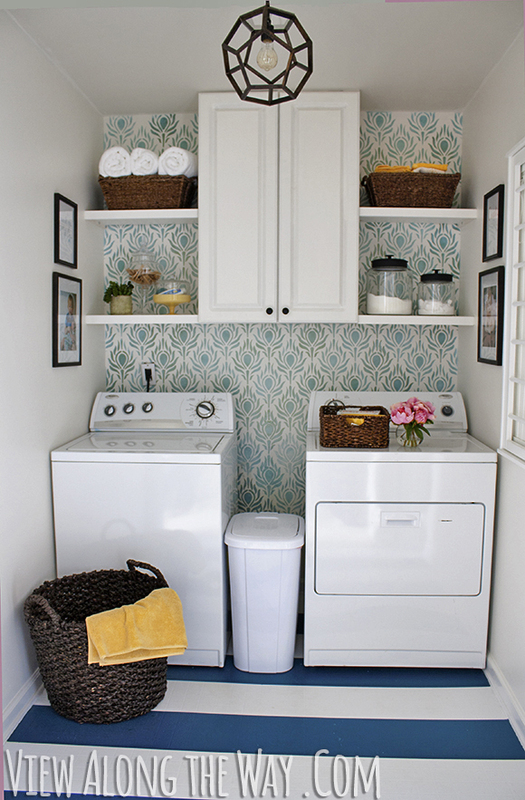 Last week I shared my tips on How to Deal with a TINY Laundry Room. We finally got ours to at least be functional, but I’m gathering ideas for how to make it pretty too. It’ll be awhile before we can do anything serious in there, but it’s fun to dream and pin and dream some more. 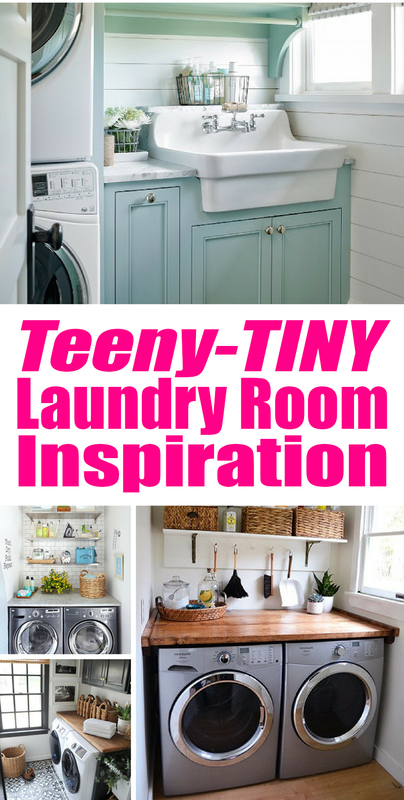 So as I was searching on Pinterest, I found a few ideas that really inspire me and I wanted to share them with you, just in case you are a fellow TINY laundry room haver. 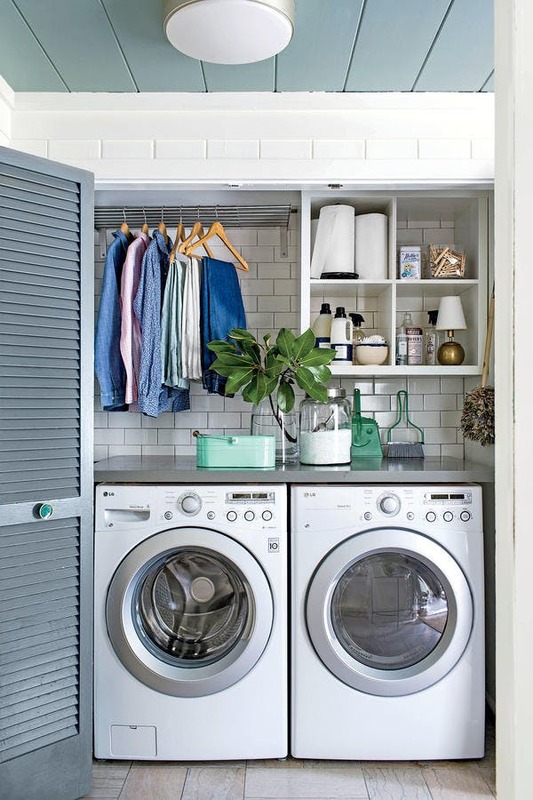 So, let’s take a look at our Tiny Laundry Room Inspiration! First, you really can’t get any smaller than a closet. Actually, I wish I had a closet. If I had a closet, the door would be on the front like this rather than the side. All kinds of access here, yo. And that subway tile? Gimme. 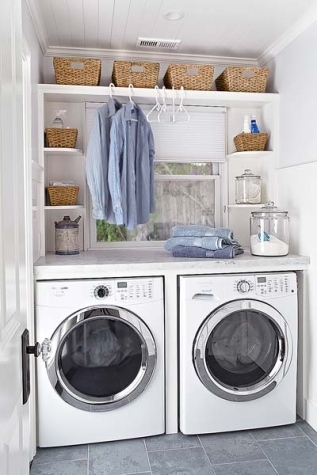 This room is clean and simple with the stream-lined shelving and gorgeous wood shelf above the washer and dryer units. To me this leans towards a more modern almost Scandinavian type feel. 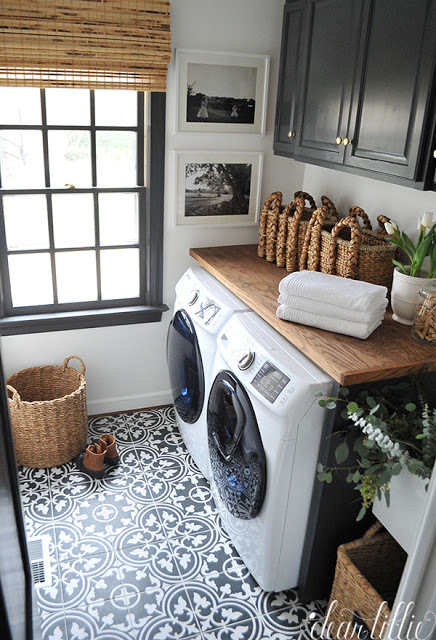 I admit, this laundry room isn’t Teeny-tiny, but it’s small. I couldn’t help but share this room because just look at that floor tile. I’m smitten with black and white concrete floor tile. I want to jackhammer all of my boring porcelain tile and put this in. Tomorrow. I’ll put that on the list for tomorrow. Haha. So here’s my idea, take the tile from the room above and put it in this room below. Am I a genius or what. Oh what I could do with an unlimited supply of green paper money sheets. 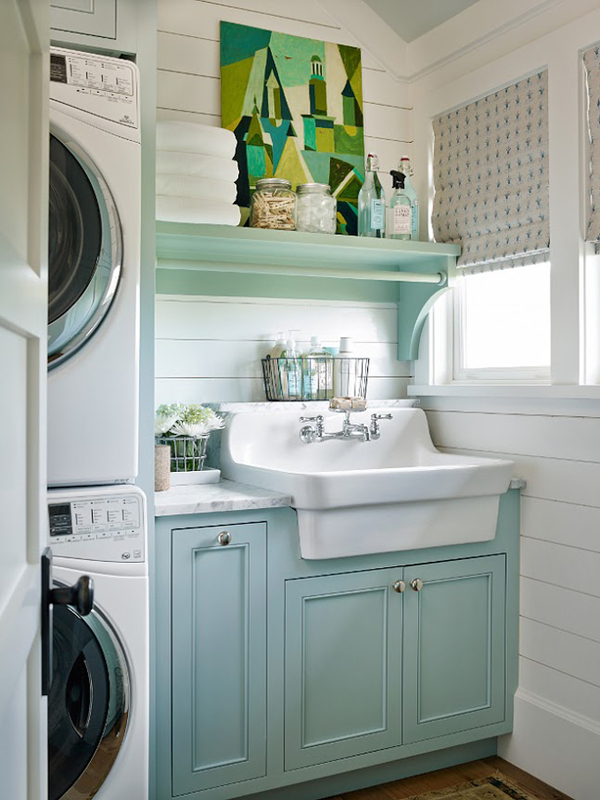 That mint cabinetry is making my heart go flippity-flop. 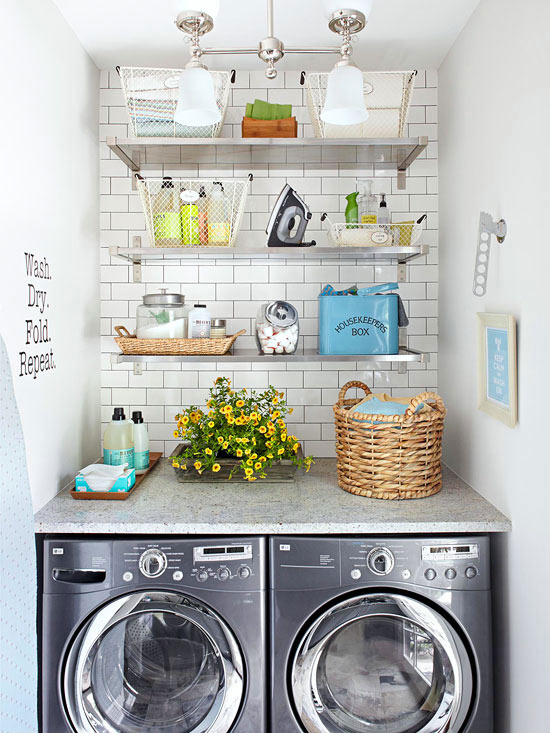 This laundry room is so clean and bright! It may be small, but with the shelving and window, I bet it feels bigger than it actually is. And the planked ceiling is dreamy. Last but not least is my bud, Kelly’s, former laundry room. From the DIY light to the stenciled wall to the striped floor, it screams NEVER DO LAUNDRY HERE AGAIN BECAUSE I’M TOO PRETTY. So, are you ready to jazz up your tiny space? Which one is your fav? I don’t even have a laundry room…or laundry machines….I walk 2 blocks to the laundromat….It’s a rough life lol. I absolutely love the subway tile look! Good luck with your rennovations!! Thanks so much, Kels! I remember those days of having to go to the laundromat! 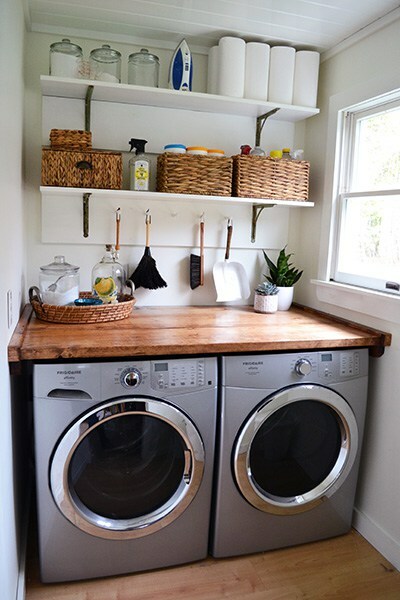 This tiny laundry room inspiration is awesome. Thanks for sharing. The black cabinets and wood top caught my eye. I have red front loaders, I just have to get a wood top like that! Thanks for sharing.